As the political landscape becomes more polarized, our media landscape does, too. In 2016, the Pew Research Center found that for the first time in 15 years, the majority of Americans in each political party express “very unfavorable” views of members of the opposing party. In 2014, Pew also found that people with different political affiliations have reading habits distinct from each other: Conservatives overwhelmingly watch Fox News for their political news; liberals tend to listen to NPR or watch MSNBC instead. In an effort to help voters all across the political spectrum understand each other (and hopefully find common ground), a new iPhone app is making it easier to break out of your media silo and find more diverse perspectives in the news. Read Across the Aisle promises to shake up your media habits just a little by suggesting alternate sources, as Nieman Lab reports. 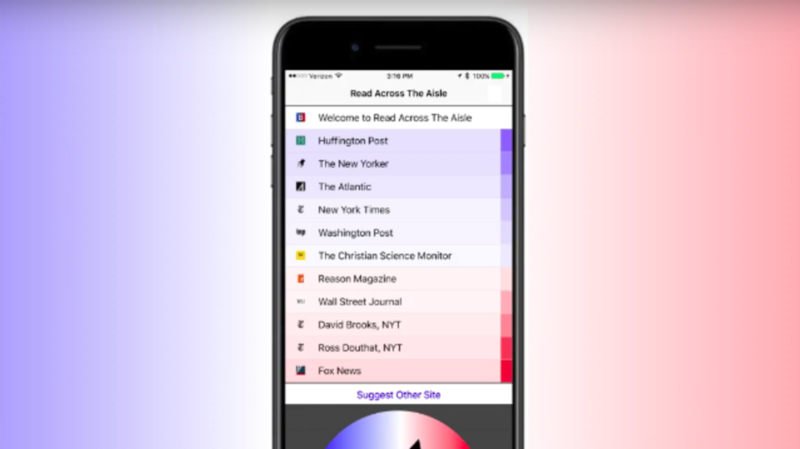 The app tracks what you’re reading from 20 curated news sources across the political spectrum, from the liberal Huffington Post to the conservative Fox News to more centrist publications like the Christian Science Monitor. Based on your regular reading habits, it will evaluate where your reading sources are on the ideological spectrum, on average, and suggest further reading that might help you balance out your media diet. The app’s judgments on where a particular news source falls on the spectrum come from the aforementioned 2014 Pew study on political polarization and media consumption. Since Pew found Fox News, for instance, to be highly trusted by conservatives but not trusted by liberals, it goes in the conservative column. Read Across the Aisle also surveyed its Kickstarter backers and users to help identify where the different news sources should fall on the spectrum. To make full use of the app, though, you have to read all your news within it, rather than using, say, The New York Times’s own app. And there are only 20 available sources to choose from, so your choices aren’t as diverse as they could be. You can read Reason magazine or The New Yorker, but you won’t find Breitbart News or Jacobin. Still, given how much social media algorithms can trick us into thinking the whole world thinks like we do, apps like Read Across the Aisle can be a good way to ensure that you’re hearing arguments and perspectives from all sides. It’s available for iOS, with a desktop browser extension in the works.